On Sundays, we like to find a nice spot for a walk. A special one that allows us to appreciate the beauty of the season that is passing. Yesterday, this is where it took us. We saw cows and sheep and goats and chicken and pigs, and when we returned home, I baked and made a salmon poached in olive oil dinner while Lulu took a long nap. And while Perry Blake was playing on the stereo, I peeled and diced a butternut squash to yet make another large pot of steaming wintry soup. For lunch today. And probably the next. That’s one of the many reasons why I love the fall. You too? And by the way, a few days ago, exactly on November 26th, this blog turned 4. Isn’t it also ironical that my very first post talked about food photography? I had no idea….It’s been four amazing and fulfilling years, with so many joys–the best thing I’ve ever *baked*–and foods cooked, styled and photographed. Needless to say that I am very thankful for you, my dear readers, to be coming back to say hello. This place would obviously be very different without you. Butternut Squash Soup is what I made today. And it’s a good thing too, or I would’ve been gnawing through my monitor at yours. Everything looks wonderful; I haven’t yet tried this salmon cooking technique, so I wonder how a fatty fish, like salmon, would taste poached in olive oil. Must be exceptionally moist. What a nice family outing! Beautiful colors – it is still fall after all. Nice soup, salmon too. What’s the pretty green cake? Enjoy the day! Happy anniversary! Your blog is always so gorgeous and inspiring. How quickly time flies. Happy Anniversary…Here’s to another great year! Oh yes, Autumn is my favourite time of the year! 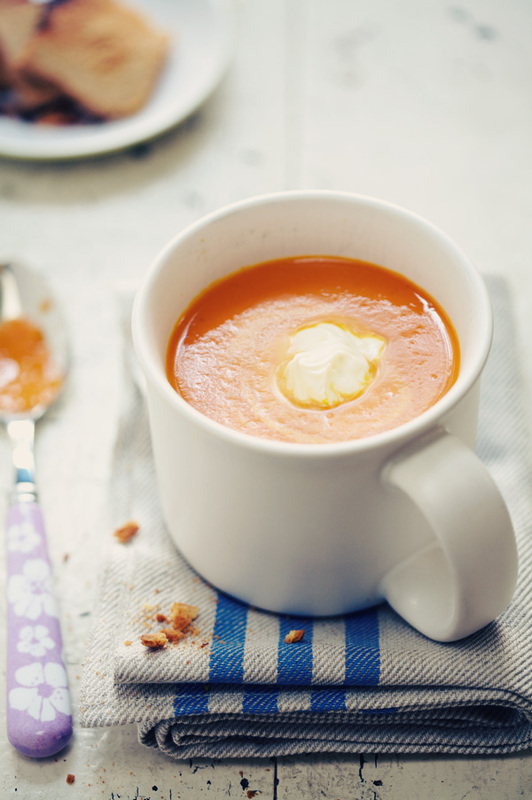 I love all the colours, and the changing tones… Plus pumpkin/squash is as good in soups, stews, gratins as it is in cakes. I’m also curious about the cake! Is it sweet or savoury? Joyeux Anniversaire à La Tartine! I second Bron, looking forward to much more gorgeousness from you and thank you for sharing so much gorgeousness with us so far. And I love fall too. Can’t wait for the cookbook. Toutes mes felicitations, Bea. Joyeux 4e anniversaire! 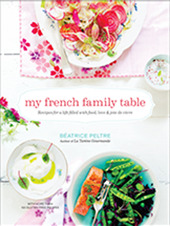 Can’t wait for your cookbook with all your gorgeous food photography. When is it going to be out? Joyeux anniversaire Bea!! Tres jolies photos comme toujours! Votre blog est un vrai plaisir pour les yeux et les papilles! Et la petite Lulu est adorable! what a luxury… and what luxurious food! Such tantalizing pictures too. Even when they aren’t food! Joyeux “anniversaire” à ton blog! Je vois que tu savais déjà quel serait un de tes points forts, de superbes photos qui nous mettent toujours en appetit! La lumière et les couleurs sont tellement douces, j’aimerais avoir ton talent! Thanks this would also add to my cookbook. I don’t let so many comments, but I always read you. It is also the opportunity for reading English texts. And some French, too. Your photos, recipes and words are really precious. I love fall too!!! For landscapes, nature and, most of all, squashes! And your beautiful photos make me feel even closer to this charming season. Happy “blog birthday”, Béa: you don’t have to thank us, but we should be grateful to you for your wonderful blog! J’adore les photos: Les paysage est magnifique et les plats me fait venir l’eau à la bouche …! Moi aussi j’adore l’automne et ses magnifiques couleurs ! Et pour moi vous avez passé le parfait dimanche : au calme et en famille… J’en profite pour te souhaiter un bon blog-anniversaire et te dire que j’attends ton livre avec impatience ! Me too, what is the green cake? So pretty. Congrats on 4 years & such a lovely blog!! Your blog is beautiful and a constant reminder of the small joys in life. Thank you for keeping us all aware of our surroundings and the wonderful food that we are blessed to share with others. Joyeux blog-anniversaire! Thank you for all the beautiful pictures and the great recipes. I’m supposed to bake healthy green & red snacks for my daughter’s winter show…. What’s in the green cupcakes? Basil? They look delicious. Thanks a lot for all these amazing posts. I wish I heard about this blog 4 years ago. 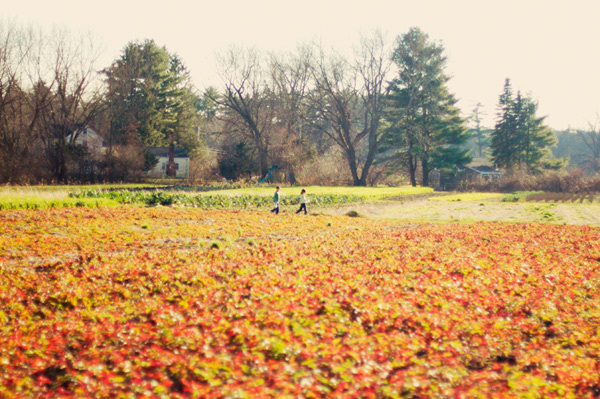 We love the fall and the farm too. Can you share where is it? 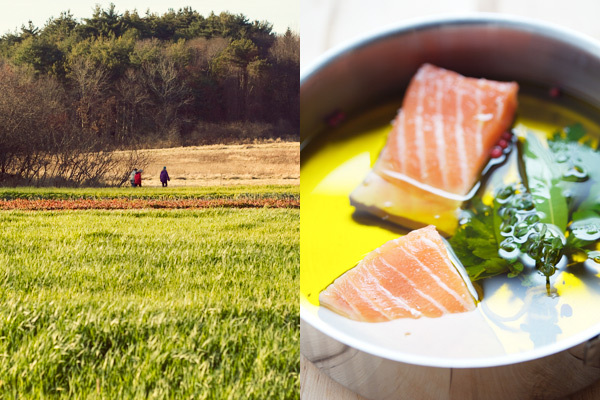 we live in Boston too and not too familiar with beautiful places like these where you can just walk and connect (most farms are privately owned and not open to everyone…). Is that Drumlin Farm? 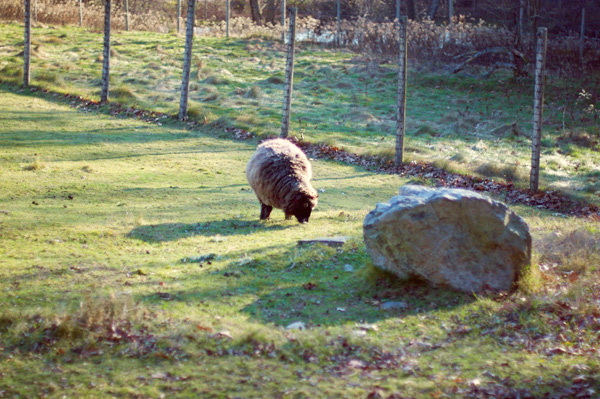 I think I’ve seen that goat before–I remember her because she looks pregnant but is not. The aftereffects on the body after bearing quadruplets! Thank you thank you merci everyone! 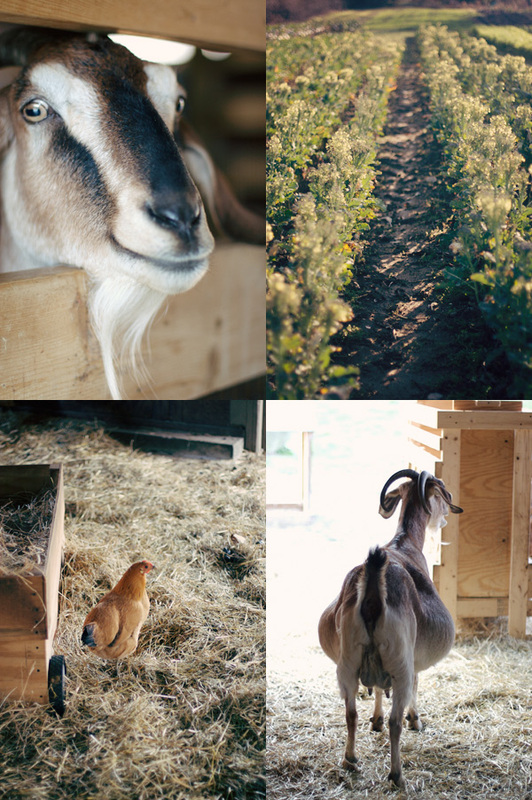 Shimon and Sara, indeed, this is beautiful Drumlin farm…. You are an inspiration. I thank you for your blog and for your ideas. You inspire me. Bea, the picture of the cupcake you posted is with pistachios? It looks really yummy. Will you post the recipe soon? I would love to try it. I love everything with nuts and specially pistachios. Merci pour ces petits moments de pur bonheur que tu apportes a la gourmande que je suis. Pendant 10 mois lorsque mon bebe se reveillait 3 fois par nuit, je lisais tes nouvelles recettes en lui donnant le sein. Ca rendait les choses bcp moins penible. Je suis pleine d’admiration devant les retombees de ton blog. C’est bien merite. happy fourth blog anniversary bea! what a wonderful place! butternut squash! its how i discovered your blog! i was living in france and i wanted to ask the lady at the market for them but my electronic dictionary wouldnt give me the translation. i knew it wasn’t courge beure noisette…:-) so i googled it and stumbled upon my most favorite food blog! it has been a delicious few years. thank you! Happy 4th blog anniversary! You have created such a beautiful and inspirational space here. Looking forward to much, much more to come! Happy Blog Anniversary Bea ! Looking forward for much more years to come.. And thanks for the wonderful pictures and recipes and stories that you’ve shared with us. Such a great inspiration for me..
A photo, more than anything else, will inspire me to cook or bake something in my kitchen… and your photographs do just that. Happy Anniversary!! Love your pictures, just beautiful! 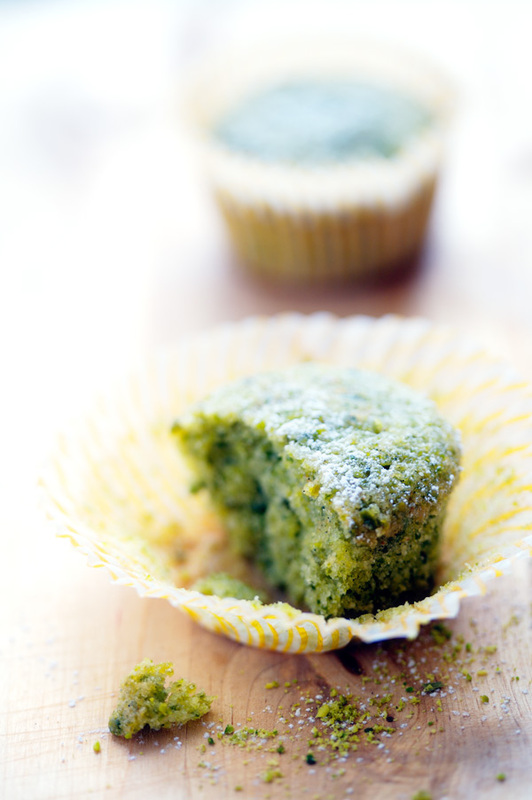 The green cupcakes/muffins look delicious – what are they? I’m looking forward to the recipe for those! Hello from Montreal ! Thanks a million for this wonderful blog. En tant que Nantaise émigrée au Canada… déjà 25 ans, (très) gourmande et amatrice de photographie, je le trouve particulièrement attirant. Vos photos sont magnifiques et j’aime comment vous photographiez votre petite puce… tout en discrétion. Bravo à vous, vous êtes inspirante. Bon jeudi, Sylvie G.
just found your blog….GREAT! where can I find the recipe for the salmon? Happy Blog-Anniversary Bea! Cheers to many many more gorgeous posts! Such a wonderful mood, I love autumn too! joyeux blogversaire Bea, ca a ete 4 tres belles annees. Bea, Congratulations on everything. could you make some recipe with green tea? I love everything with green tea, be it ice cream or japanese cookie…. I am sure you will be able to come up with something nice again… as I see a lot of your recipes with cardamom and pistachio, saffron…which is more indian… let’s go green, Yes!!!! Such stunning photos! Your food images (and all of them for that matter) are just gorgeous. So sensitive. Thanks! Wonderful! What is that delicious looking green muffin pictured above? J’aime les photos! Happy Anniversary! I have been reading your blog for some time now and I must say it is absolutely stunning! It is such an inspiration for me. 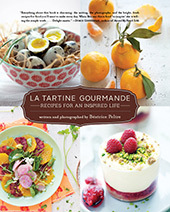 The recipes and the photos are absolutely superb! I am just one of your many fans! Congrats on the milestone, may you have many more! gorgeous photos, esp loving the one of the goat! Congratulations on your 4th birthday! Am a newcomer to your blog but really enjoying it so far. What are the green cupcakes/muffins? They looks delicious. Thank you everyone! Once again! Hi, it’s my 1st time here, and you do write very well. The shots look exceptionally classic, with a nostalgic tinge. Happy blog anniversary, albeit a little late. happy 4th anniversary to a beautiful and inspiring blog! after looking at these yummy pictures, I think I’m in food heaven! Bonjour Béa, tes recettes se font plus rare mais elles sont toujours délicieuses et je ne parle pas de tes photos magnifiques comme toujours. Je recherche où acheter ces superbes cuillères en plastique que l’on voit sur tes photos, tu aurais une adresse sur le net pour que je puisse me les acheter. Merci d’avance. oups, je n’ai pas mis mon commentaire sur le bon billet ;o) Je parlais des cuillères de la recette du jour biensûr. Do yo live in a farm? Everyday seems to be a bliss for you. The green cupcake looks delicious! When will your cookbook be published? I hope it will be soon.